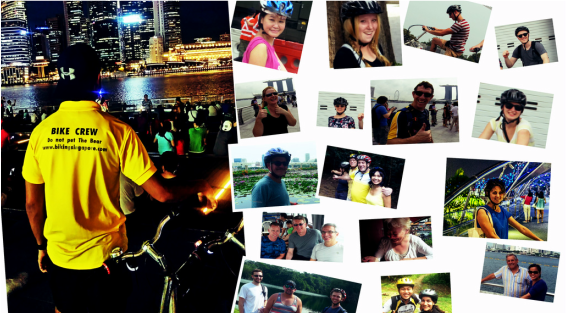 Biking Singapore features the only Evening Cycling Tour in Singapore! ​Track through Singapore's history by Day and embrace the beauty of the present by Night. From the golden streets of Chinatown to the towering beauty of Marina Boulevard. ​The Evening Tour delivers a unique and fresh experience perfect for your holiday. Riding in the Evening is the perfect remedy for hot and humid Singapore. Beat the heat and enjoy the same sights in comfort! Visit historical sights and marvel the architecture feat. Stretch out with our Bike Guide as we treat you to a local snack. Ride from Dusk to Dawn and watch as the Lion City wakes up with full light glamor right before your eyes. End the ride with the Marina Bay Sands Wonder Full Light and Water Show. A World Class display not to be missed! Click here to find out how to get this promotion. Don't miss our Day Cycling Tours too!